A war of words raging among elected officials in Rogers County by way of court filings and public allegations has escalated again. This time, the Rogers County Sheriff and five others filed an unusual motion to authorize a citizens’ petition for a grand jury investigation into allegations against the Rogers County District Attorney, three assistant District Attorneys and two county commissioners. The filing followed a request by the Rogers County commission that the district attorney conduct a criminal investigation into allegations that someone illegally entered the old, unused Rogers County Courthouse where confidential juvenile records were found unattended. According to a report in the Claremore Daily Progress, the motion calling for an inquiry didn’t name anyone in particular but the county commission chairman had previously alluded to an unauthorized entry by the newspaper. That’s the same newspaper being sued for libel by Rogers County District Attorney Janice Steidley and two assistant DAs. They allege the publication has “repeatedly published articles containing misleading and false information” and accused them criminal conduct. They say the newspaper refused to publish a retraction. March 28, 2013: Steidley, and Assistant District Attorneys David Iski and Sean McConnell file a libel lawsuit against Community Newspaper Holdings, publisher Bailey Dabney, editor Randy Cowling and reporter Salesha Wilken. April 17, 2013: Defendants file motion to dismiss and motions seeking severance of allegations in lawsuit, arguing that various articles and allegedly libeled plaintiffs are not sufficiently related. May 1, 2013: Defendants seek protective order staying discovery until previous motions are heard. May 6, 2013: Rogers County District Judge Judge Dynda Post requests reassignment of the lawsuit to another district where Steidley does not routinely put on trials. June 26, 2013: Rogers County Chief Judge Dwayne Steidley asks the Chief Justice of Oklahoma Supreme Court to assign the lawsuit, citing defendants’ preferences. Janice Steidley is the wife of attorney Larry Steidley, who is Judge Steidley’s first cousin. Judge Steidley has a policy of requesting cases in which either Janice or Larry Steidley are lead counsel be reassigned. July 1, 2013: Oklahoma Supreme Court Chief Justice Tom Colbert assigns case to Creek County District Judge Joe Sam Vassar. July 16, 2013: Defendants file three reply briefs to plaintiffs’ reply to motions for severance and motion to dismiss. July 18, 2013: Plaintiffs move to strike reply briefs as untimely, citing lack of local court rules on reply brief timeliness but referencing local rules in a nearby judicial district. Aug. 8, 2013: Plaintiffs file amended petition, adding Newspaper Holdings, Inc. as a defendant. Aug. 8, 2013: Further briefings stayed until previous motions for severance and to dismiss are heard on Sept. 5, 2013. With activity in the DA v. Newspaper lawsuit in a lull, conflict emerged at the county commission, which the newspaper had previously accused – according to the lawsuit – of breaking the law at the behest of an assistant DA. This time – according to the newspaper – the commission wants the DA to investigate the newspaper, and the newspaper says the DA’s office was behind the request. Commission minutes indicate the newspaper’s Aug. 4, 2013 article initially prompted discussion about security at the old courthouse. The newspaper on Aug. 20, 2013 reported that Commissioner Dan DeLozier said the board “took up the matter” of possible unauthorized access at the old courthouse at the request of the DA’s office. In an interview with the newspaper, Walton reportedly said he is not investigating the incident though he had earlier taken an informational report of alleged trespassing on July 31, 2013. That’s when the paper said a reporter found juvenile records “strewn” around the courthouse. 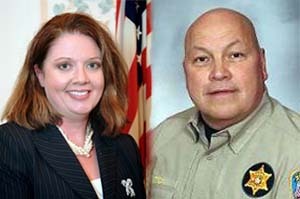 Then, about a week later, Sheriff Walton and five others filed an unusual motion asking the district court to approve a petition requesting a Grand Jury to investigate 14 questions involving Steidley and three of her assistants – Bryce Lair, David Iski and Timothy Wantland, along with two county commissioners – Kirt Thaker and Mike Helm. Alleged interference with a Department of Wildlife investigation involving Steidley’s husband and brother. Alleged illegal wiretapping of employee workspaces at the courthouse. Alleged threatening text messages hinting at “war” with the a deputy over his criticism of her professional performance. Alleged false reporting of a crime when Steidley asked the U.S. Attorney’s office to investigate a city police officer for perjury after learning the officer’s wife considered running for Steidley’s office in 2014. (That officer has since sued Steidley in federal court over the her release of information to defense attorneys that could potentially cast doubt on his reliability as a witness). Alleged destruction of e-mails that were the subject of Open Records requests. Alleged use of fraudulent data to obtain grant money from the U.S. Bureau of Justice Assistance. Alleged intentional misleading statements by Iski to a judge. Alleged failure to comply with state victims rights laws. Alleged misleading statements to a judge involving victim notification in a child molestation plea agreement. Alleged use of public equipment by Thacker to work on private land. Alleged campaign finance violations by Helm including from corporations that receive contracts from the county. If the court approves the petition, and it’s returned with 3,000 qualified signatures, the Grand Jury would be charged with investigating the questions named in the petition. As Oklahoma criminal defense attorneys who defend clients in Rogers County, we are reluctant to comment on the merit of various allegations and counter allegations. In the context of defending a client in Rogers County, it might be another matter. Earliest allegations in the current controversy included release of material that could indicate a police officer might not be reliable. If it’s relevant to our client’s case, that’s something we need to know and have a right to know. Other allegations relate to murky political motivations by various officers of the court. When we defend a client in a criminal matter, there might be political overtones we need to investigate. Any time a district attorney is under investigation, and the conduct of officers who investigate criminal charges is called into question, a well informed Claremore criminal defense attorney can help determine whether that might relate to any pending criminal charge. For a free consultation with a criminal defense attorney ready to investigate allegations in Rogers County or anywhere in Northeast Oklahoma, call the Wirth Law Office criminal defense team at (918) 879-1681 or toll free at (888) Wirth-Law. If you prefer written correspondence, you may submit a question through the form at the top right of this page.